The sacred month of Ramadan calls for the solemn practice of withstanding fleshy indulgences such as eating and drinking. And with unwavering forbearance comes the reward of Iftar – a time when loved ones gather together to break fast. So when evenings come around to indicate the conclusion of the day’s fast, be around your family, friends and good food to commemorate the moment of Iftar. 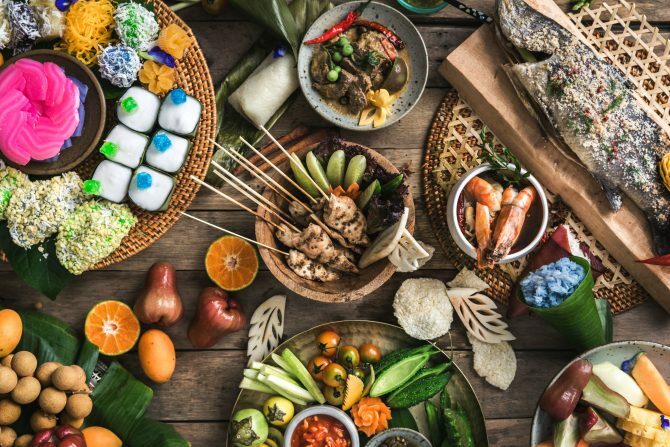 More than one visit is warranted to Blue Jasmine during the Ramadan month as the Thai restaurant is offering not just one, but four themed menus ($58 per pax) every week! Happening until 12 June from Thursdays to Saturdays, the Park Hotel Farrer Park’s eatery has fittingly named each menu after a special Night, a time when the sun makes way for the calming darkness and fasting then concludes. From oceanic delights such as Lobster Khao Soi on Seafood Night to the spicy and sour chicken soup Tom Kar Gai on Herb & Spices Night, Blue Jasmine ensures its halal-certified buffets spreads spotlight the Thai flavours some diners may yearn for. For spice lovers, make reservations during the Curry Night special, where you can slurp up curries in different culinary forms. The Grill & Roast Night will also satisfy fellow carnivores with its offerings of duck, lamb, ribeye and Thai satay. While the menus change every week, the desserts remain constant with spoils of both classic Malay kuehs as well as traditional Thai desserts – we’re talking Kueh Dadar, Kueh Ko Swee, Durian Sticky Rice and iconic Thai Coconut Ice Cream!